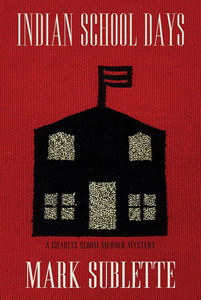 Author, Mark Sublette will be signing his latest murder mystery novel, Indian School Days the 6th book in the Charles Bloom Murder Mystery series on August 9th, 6-9pm, during the Opening Night Party. To place an order for your signed copy, call 800-422-9382 or email office@medicinemangallery.com. In 1961, two Navajo boys must bet each other’s lives—and risk their most prized possessions—to escape the wrath of the sadistic headmaster of a Gallup Indian boarding school. The white devil and his spawn will stop at nothing—not even murder—to acquire the objects of their desire. Fifty years later, a brush with death draws Rachael Yellowhorse and Charles Bloom back to the Navajo reservation, where they unwittingly stumble on a decades-old secret of child abuse and stolen heirlooms. Charles and Rachael must pick the awful lock of truth before deadly traps for the Navajo boys—now grown men—are sprung. The extended Bloom family also is in peril as the circle of life closes in on all those involved, and the white crosses in the graveyard of Two Trees Indian School yearn for justice.